Twitter Inc. is not a corporate Superfund site anymore. That doesn’t mean the company has morphed into a beautiful park, although stock investors are overly optimistic that Twitter will make the transformation. There are legitimate signs of a recovery from Twitter in its first-quarter earnings report, albeit from the depths of despair a year ago. Revenue jumped 21 percent from the first quarter of 2017, Twitter said on Wednesday, and the company continues to add users slowly. Twitter also posted a not-massaged-by-accountants net income for the second consecutive quarter. That’s not a milestone that investors typically find surprising for technology companies, but it is a notable achievement for a company that has spent irresponsibly for most of its history. This is Twitter, so there must be dark clouds to all the silver linings. The company cautioned that its rate of revenue growth will slow to the pace Twitter experienced in 2016. 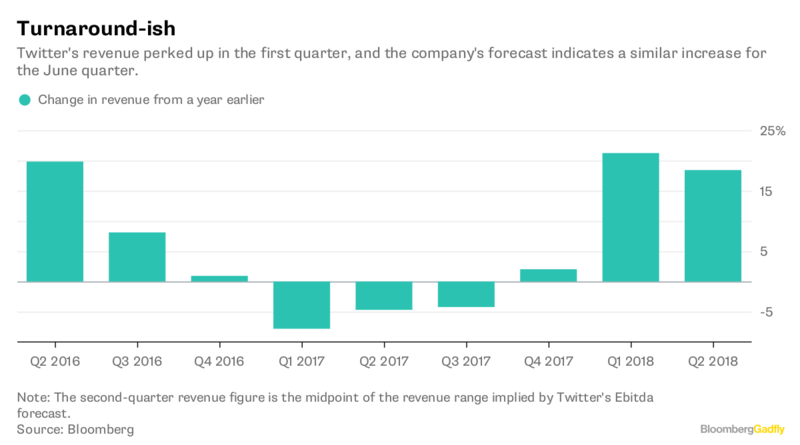 Taking the company’s forecast literally, that works out to revenue of roughly $2.85 billion for the year, or growth of about 17 percent from Twitter’s 2017. That’s not hypergrowth. Twitter’s revenue perked up in the first quarter, and the company’s forecast indicates a similar increase for the June quarter. Twitter also said it plans to hire 10 percent to 15 percent more people this year. Again, that’s not surprising for a tech company. Google’s parent company hired more than 50 people a day on average in the first quarter. But Twitter just finished a messy cleanup of its cost structure, and investors should rightly question whether Twitter has the credibility to spend wisely now. Twitter did say it expects to have positive net income in 2018 under conventional accounting standards. Again, not a milestone for most companies, but good for you, Twitter. The big concern is that stock buyers have become overly optimistic about the odds of a permanent Twitter turnaround. The company’s share price has doubled in the last year. 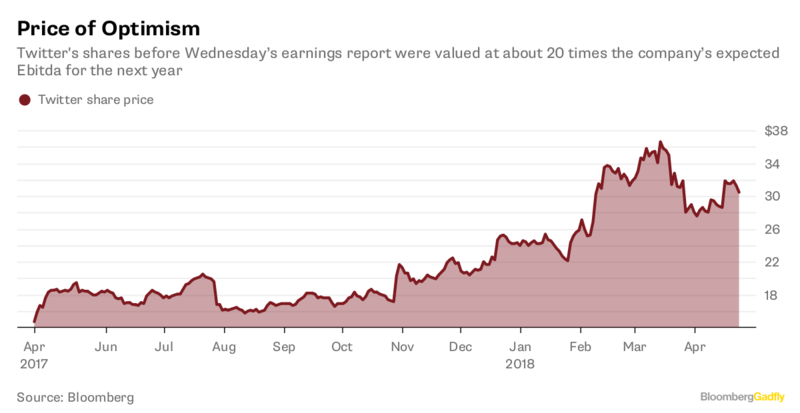 Twitter’s stock price has never been inexpensive even relative to other tech companies, but now it’s eyebrow-raising expensive. Twitter shares jumped in pre-market trading Wednesday after the release of the first-quarter financials. Shares before Wednesday’s earnings report were valued at about 20 times the company’s expected Ebitda for the next year. Those Ebitda forecasts are likely to go up with Twitter’s bullish outlook for 2018, but shares will continue to trade at a premium to Twitter’s bigger yet still faster-growing peers Alphabet Inc. and Facebook Inc. The latter company’s shares were fetching 11 times forward Ebitda this week. Twitter isn’t a mess anymore, and that is a good thing. But investors have become too excited about Twitter’s transformation from utter disaster to a relatively functional business.